How to fix the 0x80073cf9 error on Windows store for Windows 10 & Windows 8.1 mobile users. 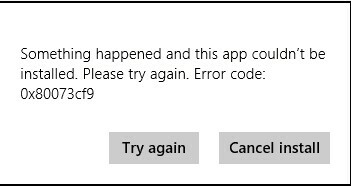 The Windows error 0x80073cf9 is encountered while trying to install a mobile app from the windows app store. This error isn’t specific to Windows mobile versions or phone brands. It can happen on any Windows OS (Windows 8.1 or 10) and any Windows phone brand or model such as the Nokia Lumia 950XL, Nokia Lumia 640, Lumia 735, e.t.c The error 0x80073cF9 is similar to the error 0x80242022. Something went wrong. The error code is 0x80073CF9, in case you need it. The problem here is that the apps producing this error will only work if installed on your phone’s internal storage. Trying to install these specific apps on your SD card will most likely give you the 0x80073cf9 error code on your Windows phone. This isn’t true for all apps as there are apps which will work perfectly from the memory card / SD card. Apps which will have trouble running from the SD card on a Windows phone are usually messaging apps like Whatsapp and Instagram. To fix this error, all you have to do is change your phone’s setting to install new apps on internal storage instead of your SD card. Here’s how to do it. Now look for the section that says “Store new apps on my”. Then choose “Phone” or “This Device”. The label might be different, but you get the logic.